When you think of Adrian Beltre, the first thought that comes to mind might just be his defense. In the early parts of his career, that was his bread and butter. He does, after all, rank 19th all-time in Def, and 10th since the color barrier was broken in 1947. By the time he retires, top 15 in Def is well within his reach. And yet, Beltre is just as prolific as a hitter! He’s been one of the best players ever on both sides of the ball. Yesterday, he became just the 31st member of the 3,000-hit club. That’s pretty amazing. It’s pretty much an automatic ticket to the Hall of Fame (don’t worry, Rafael Palmeiro will get there some day via some Veteran’s Committee). 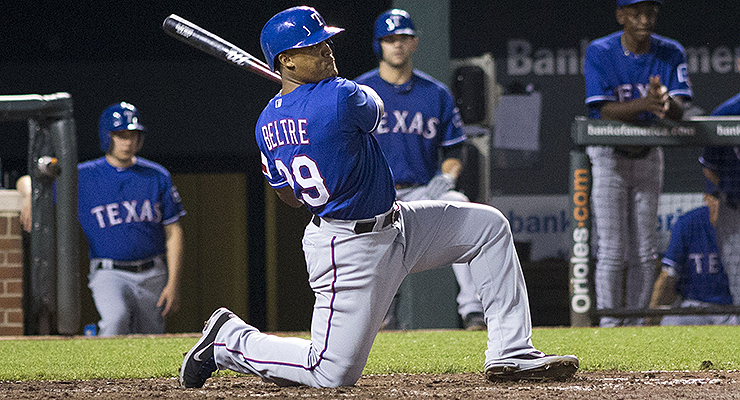 Beltre also ranks 15th in doubles, 38th in home runs, 21st in total bases and 21st in extra-base hits. * – Eddie Collins appeared in a couple of subsequent seasons as a pinch hitter as a player/manager, but I’m not going to count those. ** – Roberto Clemente likely would have played for several more seasons had he not tragically died. *** – Ichiro Suzuki is still active, which if you visit this site regularly you already know. Sixth-best on this list is something worthy of admiration. Now, Beltre might slide a little — there’s still two months of season left. But he probably won’t fall far — his updated full-season Steamer projection pegs him for a 132 wRC+, which would leave him firmly in the top 10 here. Either way, Beltre is still going strong as he enters the 3,000-hit club. That was certainly not the case for several of its members. Craig Biggio stands out, as his 3,000th hit was little more than a marketing ruse by Drayton McClane & Co. to wring a few extra tickets sold out of the Killer Bs. Biggio is one of six players (not counting Roberto Clemente) who retired after the season in which they logged their 3,000th hit. Beltre won’t be doing that. He’s on the books for next season, and I won’t at all be surprised if he keeps playing in 2019 and beyond. Certainly, the Rangers would be wise to keep him around. The three teams that let Beltre slip away probably wish they could have a mulligan on that decision. The Dodgers have done OK, as have the Mariners, but they would still have been better off keeping Beltre. The Red Sox, on the other hand…damn, damn, damn. These sorts of decisions are sometimes hard to compare, and certainly it pales in comparison to Tom Yawkey refusing to sign Jackie Robinson and Willie Mays, but in modern times, it’s hard to think of a worse Red Sox decision than letting Adrian Beltre walk in free agency. Third base may finally be in good hands now that Rafael Devers is up, but it’s been a very long time coming, and a lot of resources have been poured down a bottomless hot corner hole since Beltre left. 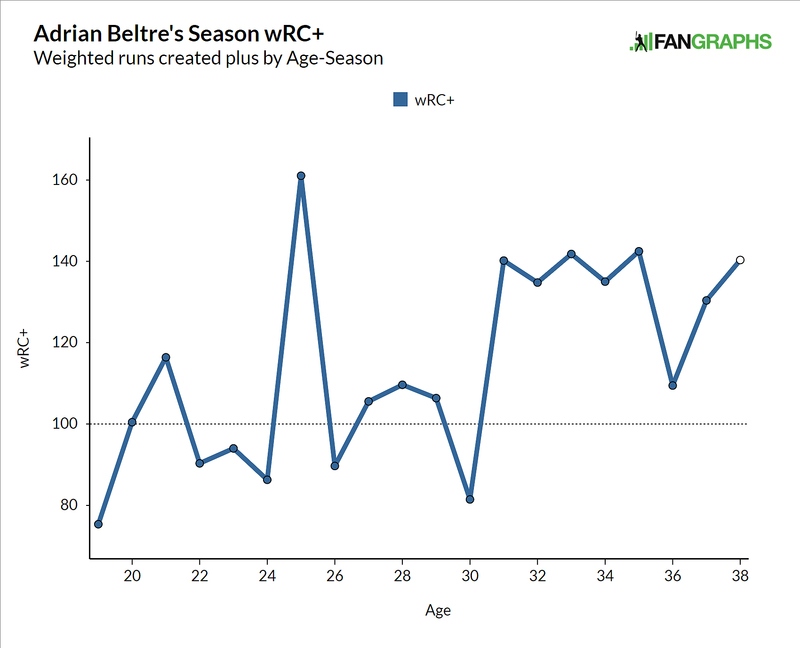 Beltre has become an all-time great specifically because he has improved as he has gotten older, in almost complete defiance of what we would consider a normal aging curve. Beltre specifically played from ages 19-29, and has played so far from ages 30-38. As you can see, seven of Beltre’s 10 best seasons by wRC+ have come in his 30s. That general shape to a graph is not something you usually see, even from great players. 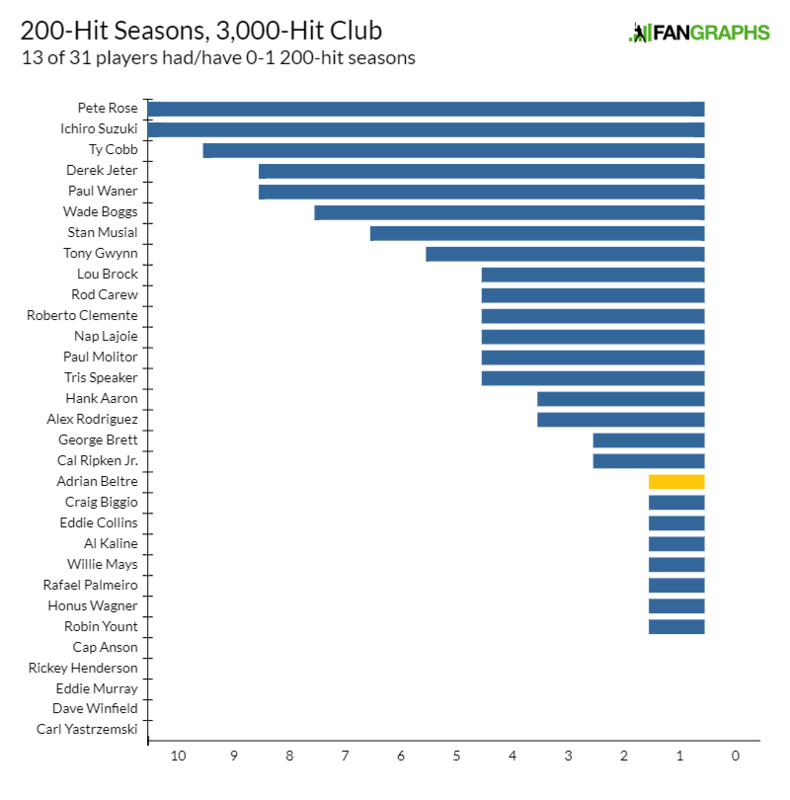 Look at some of the other players in the 3,000-hit club, like Wade Boggs or Alex Rodriguez. It’s not remotely the same shape. Of course, players can get to the same result in different ways. I grew up believing a 200-hit season was the best achievement you could have as a hitter, probably because I grew up watching Wade Boggs. And indeed Boggs has seven of them, one of the highest totals of all-time. Beltre has just one, which pales in comparison. And yet, Beltre’s way is the more common path. Would you have guessed that nearly half of the players here only had zero or one 200-hit season? I certainly wouldn’t have. Obviously 200 is an arbitrary number, but I would have thought these guys in particular would have had more of them. I mean, Michael Young has six 200-hit seasons! Adrian Beltre has left an indelible mark on the game of baseball. Some of his lasting impressions are things he does often, like bare-hand a bunt or dribbler down the third-base line, get mad when someone tries to touch his head, or drop to a knee after a very healthy swing. Some have also surely come in specific moments, like the three times he hit for the cycle, his three-homer performance in the clinching Game 4 of the 2011 ALDS, or even something more random, like that one game back in 2000 when he stole three bases. A few years ago, his Hall of Fame candidacy was debatable. Now, it’s a sure thing, and his residence in one of baseball’s most exclusive clubs is just another reason why. We hoped you liked reading Adrian Beltre Joins the 3,000-Hit Club by Paul Swydan! All counting stats when you start playing at 14 and hang on until you are 58.